The extreme conditions out at sea cause materials to degrade much faster than on land. Specific stress factors include greater exposure to UV radiation, high wind speeds and salt-laden air. The industrial climbers who carry out the regular inspections check for signs of delamination and other forms of damage by tapping on the structure and examining its visual appearance. The poor accessibility of offshore wind farms and the unpredictability of maritime weather conditions make it difficult to plan the deployment of maintenance teams, with a corresponding impact on operating costs. A typical example is the case in which inspection workers are repeatedly called out but then sent home again because the weather window is too short to permit high-altitude work. 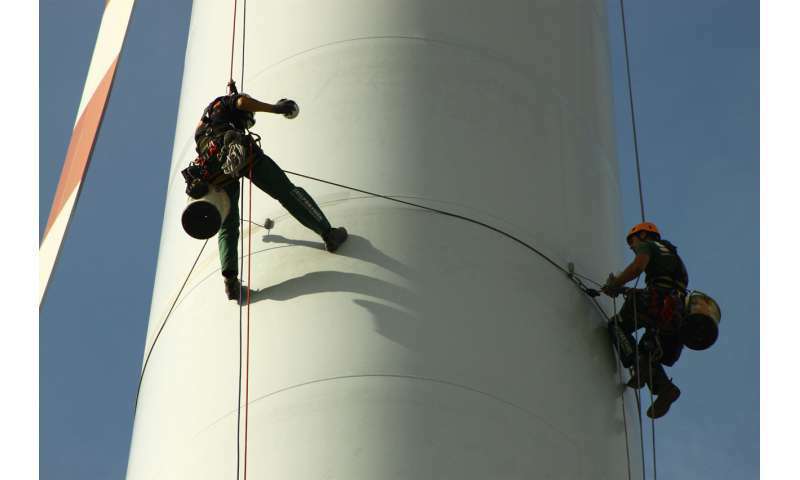 Wind farm operators are therefore looking for alternative structural health monitoring methods that are equally as reliable as regular inspections by industrial climbers. "What we need are flexible methods that allow wind-turbine rotor blades to be inspected in situ in a minimum of time and without long preparation, and yet still deliver results that are as reliable and conclusive as those obtained when inspections are carried out by industrial climbers," says Dr.-Ing. Holger Huhn, director of research and development at WindMW Service, the company coordinating the project. "The sensors work in much the same way as microphones. If the tensile forces in a specific area of the rotor blade suddenly change, the structure releases energy in the form of heat and surface waves that can be measured by the sensors. The sound waves captured by each sensor have different signal delays. By analyzing their arrival times, it is possible to pinpoint the source of the damage," explains Stefan Krause, project manager at Fraunhofer IWES. 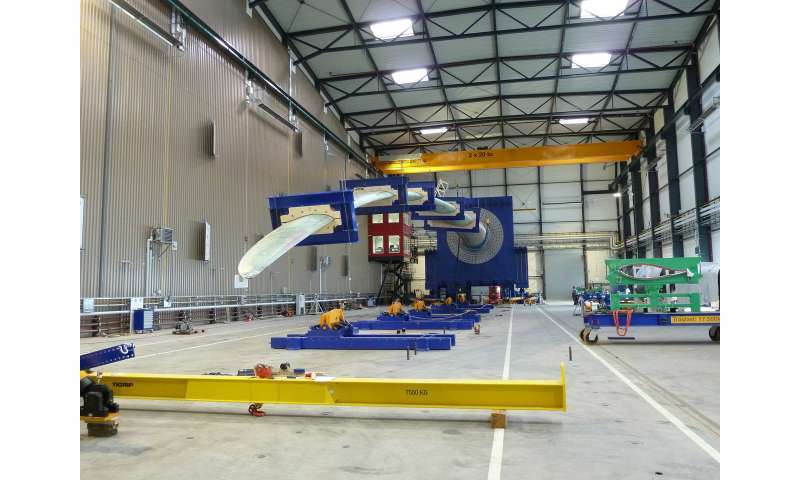 The acoustic emission measuring system has already delivered convincing results during lab tests in the institute's rotor-blade testbed facility. During static rotor blade and fatigue tests, the researchers were able to identify numerous types of damage including adhesive and inter-fiber fractures, damage to web-flange joints, cracks in the trailing edge of rotor blades, and faulty bonding in the blade root area. The next step is to test the system under real-life conditions. These tests will be carried out in the spring of 2018 in the Meerwind Süd and Meerwind Ost offshore wind parks off the coast of Helgoland in northern Germany. By attaching thermal imaging cameras to drones, it is possible to detect subsurface defects in composite materials, including delamination, inclusions, faulty bonding in the loadbearing web-flange joints, and shrinkage cavities. Under operational load, such defects deep inside the rotor blade, if not detected and dealt with in good time, can provoke more serious structural damage and eventually lead to a total breakdown. "Our aim is to combine different test methods so that such damage is detected sooner, thus avoiding the need for emergency shutdowns. 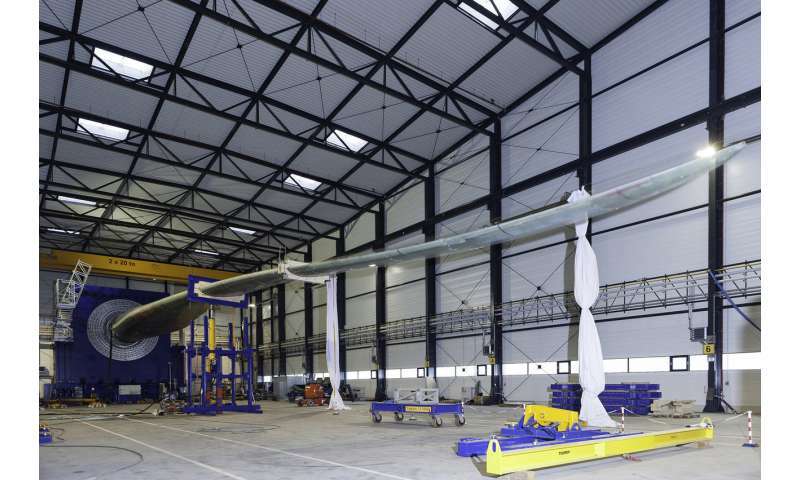 It also allows operators to carry out targeted rotor blade inspections," says Nicholas Balaresque, CEO at Deutsche WindGuard Engineering GmbH. Deutsche WindGuard Engineering GmbH has already successfully completed initial lab tests of the thermography system. The next step is to choose the most suitable camera system and type of drone. As part of the tests to validate the concept of using thermal imaging for the structural health monitoring of rotor blades, evaluation algorithms are being developed on the basis of additional measurements being carried out at the University of Bremen's wind energy research facility. To complement this work, offshore wind park operator WindMW Service GmbH is designing application scenarios for rotor blade inspections with the aim of sustainably reducing and optimizing the number of regular inspections. As well as lowering inspection costs, the new combined method promises to increase energy yields by reducing downtimes. 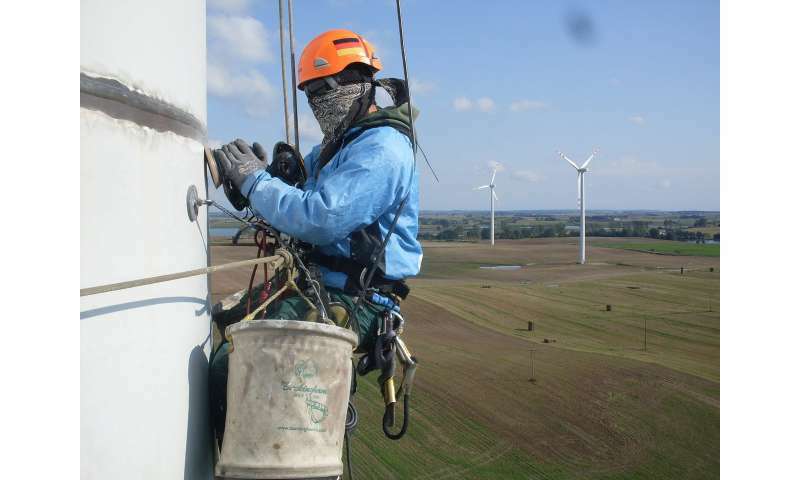 An industrial climber needs a whole day to inspect a rotor. "Using drones, the same work could be done within one hour," Krause estimates. "And a targeted inspection based on the results of acoustic emission measurements would require even less time. These new technologies, particularly in conjunction with unmanned aerial vehicles (UAVs), i.e. drones, complement traditional inspection activities by offering an efficient, safe means of inspecting rotor blades with optimized use of resources and minimum disruption of energy production."